Dimensions: 11.25" (13.1" with handles) x 6.5"
The cloche has brought my bread baking to a whole new level. I have been baking artisanal sourdough breads for years and have loved the results. The amazing baking qualities of this cloche has enhanced the flavor, improved the crumb and developed a crust that not only gives the bread that je ne sais quoi but has had me taking photos of it and sending them to my baking family and friends! I would highly recommend this product to anyone interested in baking! First bread with the new cloche!!! Delicious! Product said "in stock & ready to ship", however, after nearly 1 month I still didn't have the item. It was for a gift and obviously allowing 2 weeks for an in stock item was not enough. After multiple attemps to obtain a shipping confirmation I gave up. Finally, A MONTH LATER, the "in stock" item arrived. NEVER AGAIN WILL I BUY FROM THIS COMPANY. Works great! Delicious bread and great crust formation. Could not have been more pleased. It is nice when everything is as advertised. Had tried for years to get a good loaf of San Francisco sourdough with no success. Finally found the secret, (Breadtopia) fresh sourdough starter and this cloche. Have made about 100 loaves almost all of them perfect. Did a blind taste test vs. "Bodin Sourdough" and mine easily won. This cloche will give a great loaf of bread with a great crust. I feel like a baker now. I've been baking bread Every day in my beautiful burgundy cloche since I got it. I have given away many loafs and people want the recipe. I love this so much that I ordered the baguette baker and the loaf baker. I am so happy with this purchase and would recommend this to anyone who would love to bake their own bread. Read the reviews and already have some Emile Henry bakeware that we are very happy with. Looking forward to trying my hand at bread making! I love baking my own bread and have become obsessed with getting a crisp loaf of sourdough, rye or other artisan bread. I've had pretty good success using ceramic tile and spraying my loaves with water or putting ice cubes in a hot pan to create steam. Still, I've never been completely satisfied with the results. I hope that this cloche will help me achieve the crispy crust that haunts my dreams. Great for break making - I hope! Just what I wanted for bread baking - ideal size and shape. It is a gift for a cook in the family. My daughter in law requested this for Christmas. 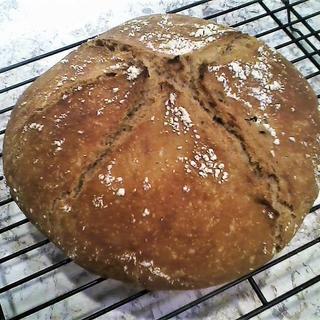 I have this bread cloche and it makes wonderful crusty bread. I am getting one for my girlfriend. Price was competitive compared to other online vendors. Also Sur La Table always has excellent products. Have always wanted it but I could not find one for a couple of years. This was for my Dad. He loved it! This item surpassed my already high expectations. It performs beautifully and it cleans so easily. My bread is delicious and it looks professionally made! Ordered based on recommendation of an instructor. Also read reviews on Sur La Table that rate it highly. We took the Artisan Bread class and loved the bread made in the cloche. 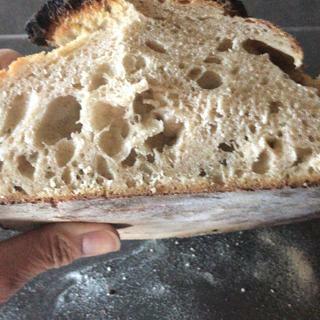 To make sourdough bread with a nice, crisp crust. Christmas gift. Product was highly recommended. Liked the color as well. I used to bake bread and got away from it years ago. Now that I will have time to experiment more in the kitchen, I think this Emile Henry Bread Cloche is the ticket to get me motivated. I also love all of the Emile Henry made in France products that I already have and wanted to add this to my collection. My daughter is enjoying baking bread! Great reviews, I like that it doesn't have to be preheated and you can let the dough rise in the cloche, it's pretty and I love to bake bread! I am a bread maker, and I read the reviews. I think that steam produces an exceptional loaf of bread. I sometimes have thrown ice cubes in the oven!! This is much, much, much easier!! Love the Emile Henry Bread Cloche. I bake bread. This is a nice tool to have on hand. I can make the bread using a mixing bowl but this adds some style to the show. 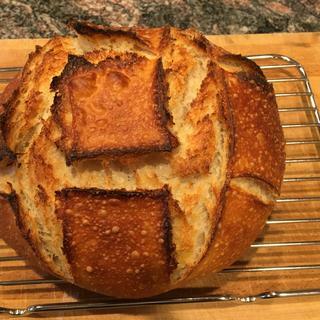 Took a bread class with Elizabeth Prado in Palo Alto recently and am inspired! 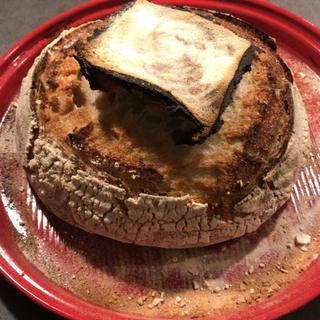 I bake bread every week, but with my dutch oven I am always in fear of burning my arms on the deep sides of the 475-degree pre-heated sides when placing the bread dough in it. This seems to be a much safer option. How is this different than the previous EH Bread Cloche that was sold? BEST ANSWER: Emile Henry products have been completely redesigned with the American consumer in mind. Dishes are deeper with slightly flared sides, handles are larger and easier to grip with oven mitts, and lids have been redesigned to seal 20% better. How does this differ from the bread pot? BEST ANSWER: A bread cloche has a shallow, flat bottom with a bell top. A bread pot is a pot with a domed lid. You can make equally good bread in either, but a bread pot can only make a bread in a diameter smaller than the bottom pot (since you generally don't want the bread touching the sides--if you look at the picture of the bread pot, you'll note the bread isn't touching the sides), and only in a boule (round) shape. You can also use the bread pot for making other things (potatoes, casseroles, etc. ), whereas the bread cloche is only made for bread. Is the base to this bread cloche a pizza stone? Could I use it as a pizza stone on my gas BBQ or oven? BEST ANSWER: It's similar in shape, but it's not the same as the pizza stone. It's smaller in diameter & has a larger lip on it. It wouldn't yield quite the same results. How do you tell if you have the old or new EH bread cloche? Asking because I do not know what the "old" model looks like..thanks! BEST ANSWER: Sorry but i'm not sure I can answer this. Didn't know this was something to be concerned about. I think the old version had a high gloss finish and the newer ones have a more matte finish. I wanted the high gloss finish just because i preferred how it looked not because I thought there was a difference in quality or performance. I was able to get one with a high gloss finish because Sur La Table had one out on display. If you have to order one I think you will get one with the matte finish. We haven't used ours yet. So all i can tell you is that i think anything from Emile Henry will be a quality product. Mine looks like the one in the photo and I recently purchased it in March. Hope this helps! do you preheat both the bottom and the lid of the cloche? BEST ANSWER: I do preheat both the top and bottom. Be careful to position your bread dough away from the sides or it can stick to the lid! Anyone who ordered this online, can you please tell me if it ships inside its own box in the mailing box? Or is it just wrapped up inside the Sur La Table box? I'd like to give this is as a gift and would prefer it was in its own box. Thanks! BEST ANSWER: Yes, it is in its own box. I even store it in the box. Nice and sturdy box. Keeps the lid in place and the dust off of it. My first bread dome for baking, I love it! Mine came in its own separate box. It would make a wonderful gift! It is shipped in it’s own box inside the shipping box. It was in it’s own box. I love it! Has anyone used this to make gluten free bread? How did it work? BEST ANSWER: We do not know how it works with gluten-free bread. It works very well with gluten bread. I would predict that it would work as well with gluten-free dough as any other method would. No. But all other breads bake beautifully. I’ve never made gluten free bread-sorry! Are there any particular recipes geared to this cloche or can you just use 'regular' recipes like from James Beard or other chefs/bakers? I'm a bit puzzled about the lid. BEST ANSWER: Just purchased! The lid is to keep the steam from the loaded dough trapped around the bread instead of dissipating into the oven and out any vents. (Professional bread ovens have steam injection, and so don't need lids, although a lot of restaurants who bake their own bread will often use cast iron bakers.) If you are making boules (round loaves), this cloche will make boules in diameter up to about 10.5-11". (You don't want to have the bread hit the sides of the lid.) If you are making more than single loaves of bread, and want to make batards (oval loaves of bread), a cloche is not usually the most space-wise option--an oval baker is usually better because you can generally get more than one loaf baking at a time--but for someone baking single batards, you can go up to 10.5-11" in length without the bread hitting the lid. Any recipe firm enough to hold a loaf shape will work in this cloche. I don't usually make particularly high hydration loaves, but if I am going over 60-70% hydration, I will use a long, slow proof in the fridge (usually about 15-16 hours), slashing right before I load the bread. This helps a high hydration loaf hold its shape during loading. I bake at a higher temp, not least because I love a mahogany crust with a lot of crunch and shatter. Preheat the oven and empty cloche at 500 deg F. Load the bread using a peel and semolina flour or parchment paper and cover tightly with the lid. Bake for 20 min, then uncover and bake at 450 for another 10 minutes. Lower the heat to 400 and continue baking until the inner temperature reaches about 210-220 and when you tap the bottom of the loaf it sounds hollow, with the loaf feeling light for its size. But every baker, oven, and bread will mean you'll need to experiment to find what times and temps work for you. I'm looking forward to experimenting with the EH cloche and expect it to change my times and temps. Having received the cloche and done some baking, I can say that right now what works best is preheating the oven and empty cloche to 500, loading the slashed loaf and putting on the lid, lowering temp to 450, baking for 30 minutes, then removing the lid and baking until the interior temp is between 200-210 or so. What I love is that sign that the steam is trapped; when I take off the lid, there's a shot of steam! I'm still experimenting, and am going to try leaving the lid on for 35-40 min and then a final baking to color the crust, as I have many folks who don't like the same mahogany crust that I do. Excellent question. I stumbled on a guy from Scotland who was making bread and found out I can buy a starter for sourdough bread. I purchased one and started feeding it. The baking wasn't great at first until I saw online that people were using the pot. So I bought one. The steam and the heat are incredible for these kinds of loaves. You preheat your oven with the empty pot at 450 degrees. After 20 min, you add the dough. Cover the pot, and bake it for 45 min. Seriously, it is magical.